Toast waffles as directed on package. Meanwhile, in 1-quart saucepan, mix raspberries, sugar, honey and gingerroot. Cook over medium heat 5 minutes, stirring frequently, until sugar is dissolved and sauce is thickened. Remove from heat. In small bowl, beat cream cheese and yogurt with electric mixer on medium speed until smooth. 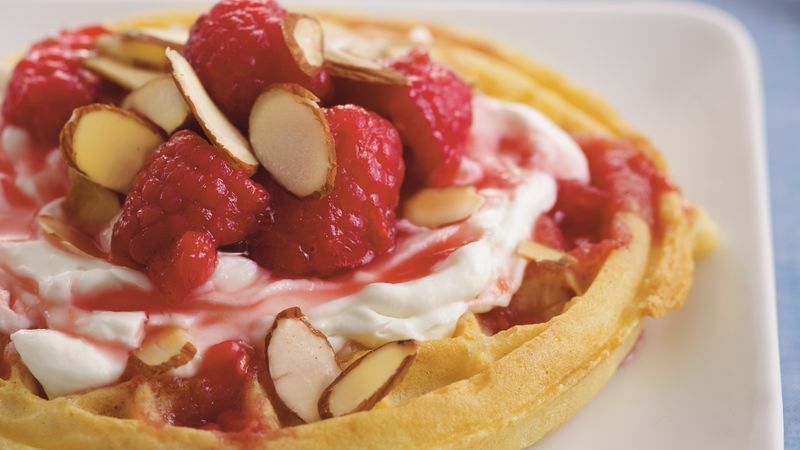 Spread cream cheese mixture evenly over waffles. Spoon raspberry sauce on top; sprinkle with almonds. The cream cheese and raspberry toppings can also be spread on toast or biscuits.